Gold futures scored a fresh, more than three-month high on Tuesday, extending a string of wins to seven sessions in eight with three of them in a row. Gold for December delivery edged up 90 cents, or less than 0.1%, to $1,165.40 an ounce on the Comex division of the New York Mercantile Exchange. The settlement is the highest since July 6 when prices advanced to $1,173.20 an ounce. 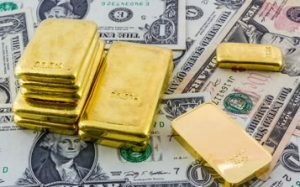 "Gold is continuing to benefit from the weakness in U.S. dollar and safe-haven buying due to growing uncertainty about the direction of the stock markets," MarketWatch quoted Fawad Razaqzada, analyst at Forex.com. Gold prices traded from a low of $1,151.30 to a high of $1,164.40. They moved up in the prior session by 0.7%, after advancing last week by 1.7%. In other precious metals dealings, silver for December delivery climbed 4 cents, or 0.3%, to settle at $15.91 an ounce. Silver prices ranged from $15.62 to $15.93. They opened the week on Monday with an increase of 0.3%. January platinum fell $3.30, or 0.3%, to $992.60 an ounce, trading between $979.10 and $998. Palladium for December delivery lost $9.30, or 1.3%, to $685.35 an ounce, ranging from $681.10 to $699. Gold added 30 cents to $1,165.20 an ounce. Silver declined 35 cents, or 2.2%, to $15.61 an ounce. U.S. government agencies closed Monday for Columbus Day holiday. On Tuesday, United States bullion sales moved up by 6,500 ounces in gold coins and 845,500 ounces in silver coins. The U.S. Mint has limited sales of bullion American Silver Eagles since temporarily running out of them in early July. The agency allocated 1 million coins for this week. With Tuesday’s gains, 154,500 remain. Silver Eagle sales at 37,975,000 for the year continue at a record pace, up 9.2% from the same time in 2014. Last year when sales ended at an all-time record totaling 44,006,000, the coins by this time reached sales of 34,771,000. Question: Did US Mint use USA mined silver or Imported from overseas ? Had they report ? The U.S. Mint buys most of the planchets for American Silver Eagles from Sunshine Minting (www.sunshinemint.com).